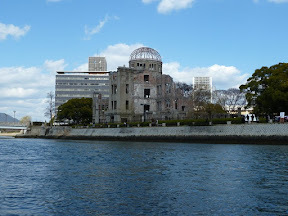 Since learning about world war two, back in third year at high school, I had always wanted to visit Nagasaki and Hiroshima, but it was Nagasaki that I really wanted to go to. After spending three days here it really has been a fascinating and moving visit. Arriving at the city at around 8pm, I hadn't planned to stop anywhere, but was given some tips from a former resident when I was in Tokyo. Sadly I couldn't for the life of me remember his directions to the pod hotels. Wandering out the station I started seeking for a wifi hotspot, and for some reason, in the country renowned for leading the world for tech there wasn't any (something I noticed in Tokyo too). I headed to the nearest hotel I could see and asked how much the rooms were. '¥6,500 was the reply (just under £60)...ouch, this backpacking isn't going to last long. 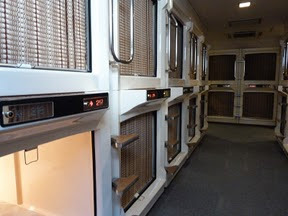 I asked the lady behind the desk if she knew of a pod hotel with rooms for about £30 per night. She had a chat to some colleagues and then got onto the phone to the hotel I needed to check prices. She the informed the price to me, got me a room (well a pod) and also booked me a taxi. Hows that for customer service! I arrived at then pod hotel, walked straight in with my shoes on which turned out to a big no no! 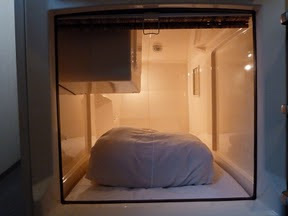 The pod hotel was also a spa too, and as such your shoes need to be left by the door or put into your own shoe locker. The pods themselves were quite neat and one floor up from reception. About the size of a single bed with a tv, radio and light, with a see thru blind at the "door". The bed, like most in Japan, was hard as hell, so sleeping on top of the quilt for a little extra cushion was certainly the way forward. Now, I didn't realise the place was a spa as soon as I went in. It wasn't till the following morning from checkin when i fancied a shower that it was just an ordinary pod hotel (if ordinary is the right word). Looking all over the floor I was on, I couldn't see a shower anywhere. It wasn't until an old man emerged out of his pod, as if he had just woken out of his coffin from being dead for twenty years, and began to stumble like a drunk past me and down the stairs. So I followed him. Going past reception and through a glass door was a large, dressing/vanity room, sat down were about 8 naked Japanese men, shaving, styling their hair, moisturising their face. Ushering around them was one of the ladies that worked their cleaning up after each position was made vacant. Following on from them was another steamy glass door which I quickly headed for, still wearing my shorts and T-shirt and boom - massive steam room, jacuzzi, spa pool and sauna. I took of my T-shirt and wondered in to discover, yet more naked Japanese men. So I thought, sod it, and went native. 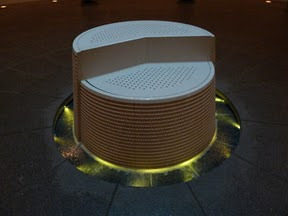 So whilst chilling out in the spa pool I started to hunt for these elusive showers, when I noticed in front of me a row of small stools, and I mean like the ones you used to have at primary school. I front of these stools were shampoo, conditioners, body wash, a bowl and a shower head. Then a gentlemen sat down on one of the stools and showered...whist sat down! 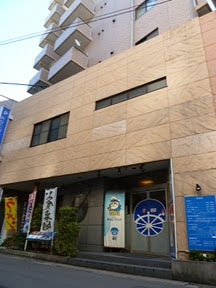 It all made sense, and so twice a day I chilled out in the spa for an hour or so, relaxing, and being the only non Japanese and only English speaking person there. Seriously no one spoke a word of English, not even the staff. Trying to explain that I wanted to stay for three nights was tough work, but acting out what i wanted to do seemed to get by. The hotel on the whole was incredibly vain, with so much stuff around to use for free, like hairspray strong, hairspray soft, mouse soft, mouse firm, hair tonic, hair cleanse, face conditioner, after shave, scales, blood pressure monitors. It was if they knew I was coming. 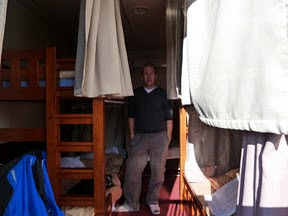 There are loads of spas (with or without pod hotels attached) all over Japan. 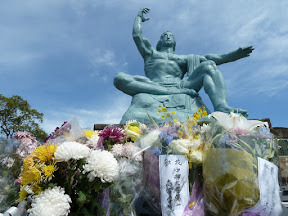 The first full day i spent touring Nagasaki turned out to be quite, in fact no - more than that, it was deeply moving; something i didn't fully expect. 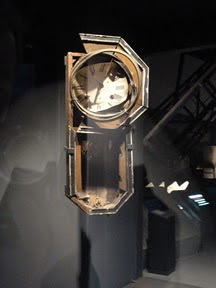 I started off visiting the hypocentre, this was the moment when the bomb hit the city at 11:02am on 9th August 1945. 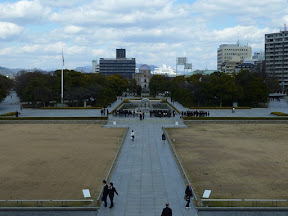 Standing at the point of impact was a black monolith, elevated by a grass mound to represent what the ground level originally was before the bomb exploded (the bomb itself exploded 500m above the ground and flattened a third of the city killing and injuring 150,000 people). Around the park are some plaques, relics that survived the explosion (such as concrete candle lanterns belonging to a church), and a statue of a stricken child in it's mothers embrace. 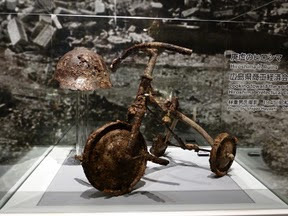 "When considering the present prosperity and peace of Japan, we must never forget the fact that about 70% of the victims of the Nagasaki atomic bomb, which exploded over this city at 11:02am, August 9, 1945, were children, women and senior citizens." 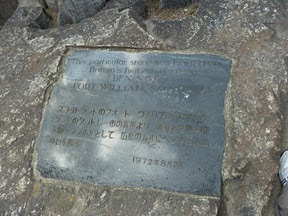 Standing in that park, reading that plaque, took your breath away for a second. 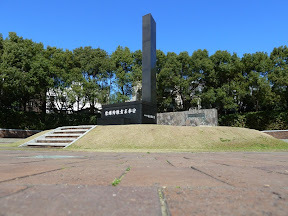 I sat down in front of the monolith waiting to take a good shot and observed a couple of Americans, the only non easterners I've seen in Nagasaki, smiling and taking photos of each other by it. I was then approached by a local mother with her two children who asked where I was from, about my trip, and what I think of Nagasaki. Many of the people here really are that friendly. 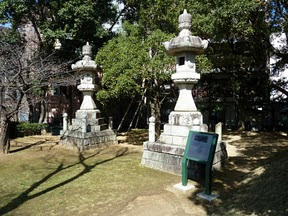 I then headed off to the peace park, a five minute walk from the hypo centre. The park was quite busy and housed many peace statues donated by various countries around the world (non from the UK or US though). But there were two things that were impressive here. 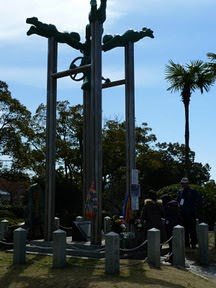 The first was a giant statue of a japanese man, sat down with one arm outstretched (pointing towards the hypo centre) and one arm in the air (pointing towards peace). His eyes were closed to symbolise praying for those that perished. The second was of some bells from a factory destroyed in the explosion, which had fresh flowers beside it (with buckets of water and ladles) and an old gentlemen stood next to it. This gentleman, born in Nagasaki, was a young boy at the time of the explosion and worked at a factory 1.1 km from the hypo centre (1km is a 100% death rate aka ground zero). He tells me that just before the explosion his boss asked him to go fetch something from another part of the factory. As he got there the bomb exploded, wiping out the whole factory, killing nearly everyone in it, including his boss, but he and one other person survived. 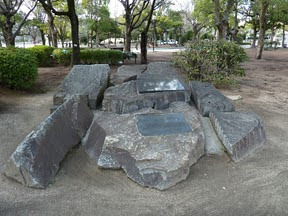 Ever since, he voluntarily stands at this spot in this park telling people this story to remind everyone of the 'horror of the atomic bombing and appeal for peace'. Locals and visitors will put water on the flowers, take a step back and pray (a similar scene to the cenotaph on remembrance sunday). 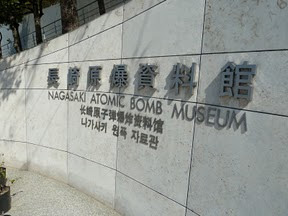 Next stop was to the Nagasaki Atomic Bomb Museum. This place was truly and quite rightly harrowing. 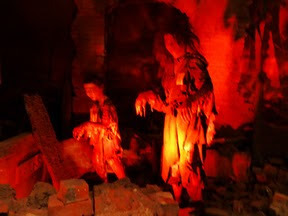 The museum depicted the tragedy that besieged the city, and you learn of the suffering moments after the explosion and even decades ahead. 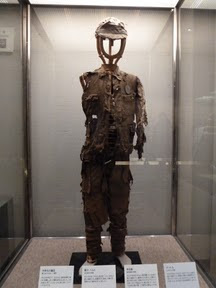 There were exhibits of burnt clothing recovered and a soldiers helmet with skull melted on the inside. These were no more haunting than the pictures of injuries and bodies that coated the city, and the stories strewn on the walls of how people watched their children, parents and friends die before them. The bombing of Nagasaki nearly never even took place. 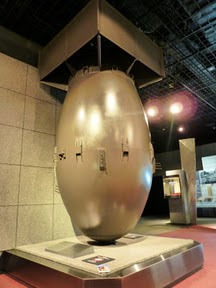 The city was a plan B in case the bombers couldn't bomb their originally planned city, which due to poor visibility they couldn't so they headed over to Nagasaki. But when they arrived overhead the cloud cover was too bad and so they were ready to abort and head back to base. As they were doing so, the cloud broke and they dropped the bomb. You learn how the idea to use a nuclear bomb on Japan was agreed in Hyde Park, London on 18th September 1944 by Churchill and Rosevelt and that swathes of the scientific community wrote letters objecting to the use of nuclear technology for weapons. The bomb was originally going to be used, and was designed to be used, against Germany before they surrendered (Einstein and a few other scientists fled Germany to the US and told the government that Germany was working on a super bomb). The reasons for using the bomb appeared to be more political than a necessity. Originally the reason was centred in a speech by Roosevelt that he wanted to bring an end to the war as quickly as possible. At $2bn (a bigger budget than the whole Japanese military) the Manhattan project had to deliver results and the US needed to come out as a superpower compared to Russia and so they took the decision to drop. Records now show that in a congressional hearing a year later it turned out that Japan was going to surrender anyway. What a tragic waste of life. 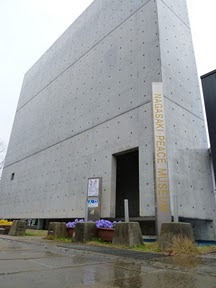 So despite all that I learnt at school or had read since, visiting Nagasaki museum and peace parks taught me a lot about the true effects of the disaster and how a city scarred by the tragedy rebuilt itself. That's what this trip is all about. 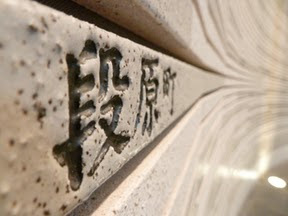 The following day it poured down with rain, and so refreshed after my morning spa I decide to hit some art galleries. Which were pretty dull as paintings aren't really that interesting to me. I did however see a Picaso (called the Two Ladies I think). Towards the end of the day I could feel the onset of a cold and soar throat coming on (I'm blaming the steam room in the Spa!). So was a crap nights sleep and felt crap in the morning. I decided to treat myself to a traditional Japanese delicacy...McDonalds breakfast :) yummy! The McD's here are pretty cool. 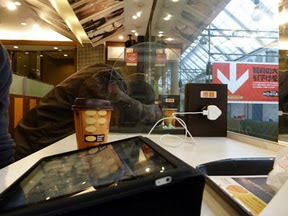 They have charging stations for laptops and mobiles - but oddly no wifi - I discover this is because the 3G phone coverage is that good who needs wifi. And the options on offer for the day menu are good too. Teriyaki burgers, lemon chicken and similar to the US they have a sweet egg scone sausage McMuffin...perfect. Also, you'll see this a lot in Japan. People will just have quick power naps. It's quite odd. Was in an electronics shop and someone sat at a table for say five minutes had a nap. Dosed up on drugs and a McD's I headed off to Hiroshima. The hostel was the near the station and was fab. Loads of the guests were westerners so was good to speak to people again after three days. The night I arrived I went out for dinner with a lad from Switzerland called Felix. He introduced me to dome funky Japanese meals (he's been here quit a few times & speak the language fairly good). 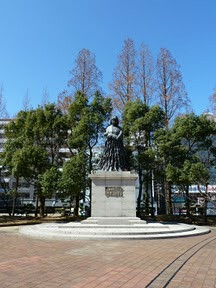 The next day I went on a walkabout around the city, heading towards the peace park and museum. 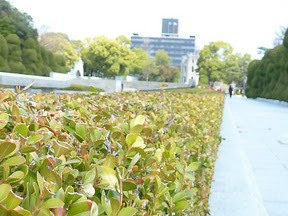 The peace park was beautiful and well designed and full of tourist and school children. 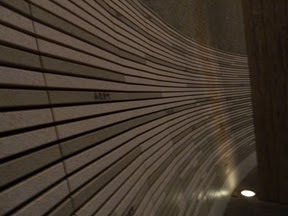 I first headed to the memorial centre for those that lost their lives in the bomb. A very cool designed place, it was an incredibly spiritual and simple place. 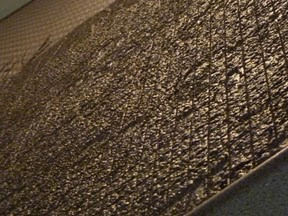 In the centre was a monument which depicts the time of the explosion, 0815, and around the wall a panorma of the city made up of 140,000 tiles, each one representing a life that was lost. 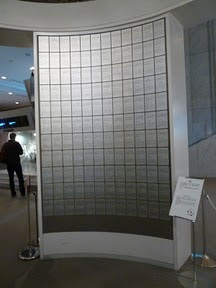 Below that was longer tiles each showing the district in Hiroshima that was destroyed. The room was silent with the exception of the monument which had water flowing down it. 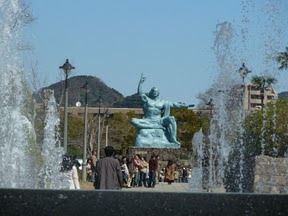 Water is a common theme in both Nagasaki and Hiroshima as it represents the feeling at the time of the explosion that people, who were quite literally and horrifically melting, needed and begged for water to survive. 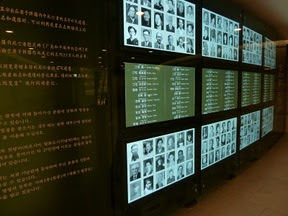 In the next room were TV screens showing pictures and names of all those known that died on that day. It was quite staggering to see. 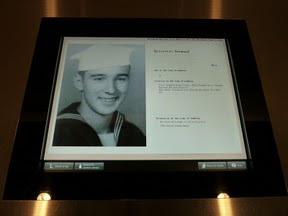 There were computer terminals where you can search for information on the names and where they died including a photo. 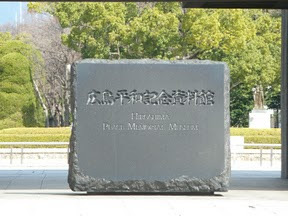 Leaving the memorial museum, i headed to the main museum. 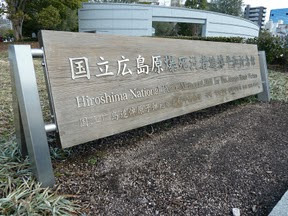 This museum was huge and portrays a fairly balanced view of the disaster. With some stunning displays and incredibly shocking photographs and wax models. The museum also had copies of the actual orders for bombing. 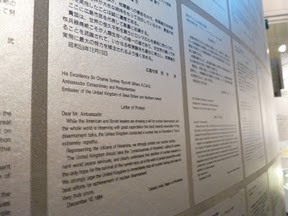 Another interesting display was the letters to embassies. 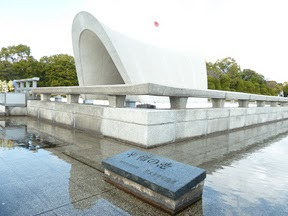 Each time a country (UK, France, US, Russia, China and India) perform a nuclear test, the current mayor of Hiroshima writes a letter of protest. 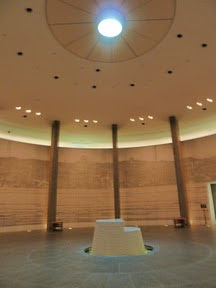 After the museum i headed to the (now called) peace dome. Despite being meters away from the hypocentre part of the building survived, everyone in the building died of course. 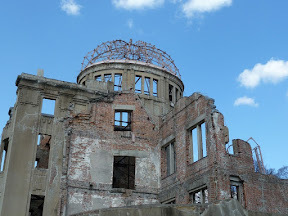 It was quite a stark reminder of the bombing and is now a world heritage site. 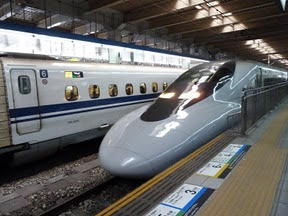 I then had a quite evening in the hostel, chatting to a few lads from the US, and now today I'm on my to Kyoto, the former capital and still spiritual home of Japan. 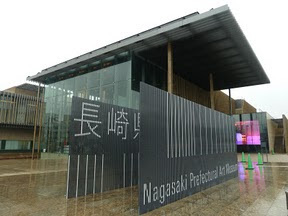 But to summarise both cities, i found Nagasaki the more moving of all places to go to, perhaps it was the first place i went too and had a sense of numbness when i visited Hiroshima but i think in part that it wasn't a 'tourist attraction' feel like Hiroshima, it was more intimate and low key. 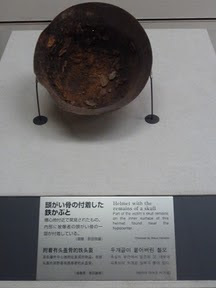 Hiroshima did have more exhibits and details but lacked the pureness of the Nagasaki museum. Both cities are well worth a visit as it really does change your view on things. Right, that's it for now, hopefully I've managed to fix the picture and text wrapping problem. When I get to Honk Kong in a few days I'll make public all the pictures I've taken so if you're incredibly bored at work you can have scan through. Hi David, enjoying the blog very much! Keep it up! 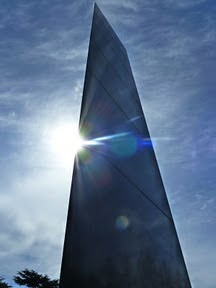 Fab pictures and your trip seems to be getting better by the day - you're cramming in so much! Amidst the very interesting history lesson, I especially liked your comment about the guy emerging from his coffin and the story about the guys sat showering on stools! Very funny!! I wonder what awaits in Hong Kong?!! Glad to hear you're ok - you had me worried there for a while. I guess I missed the bit where you packed your guardian angel in your rucksack ! AMcD. Top read fella. A career as a travel writer beckons!